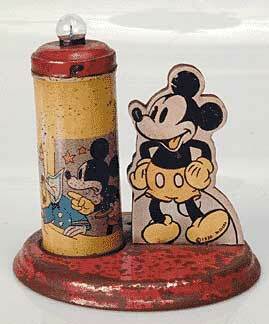 1936 Mickey Mouse candle light that stands about 4 inches tall. 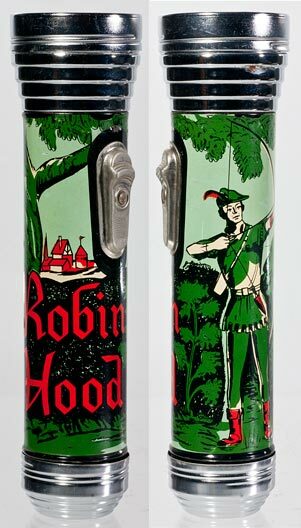 I also have had a Snow White version and I assume that there were other Disney characters. 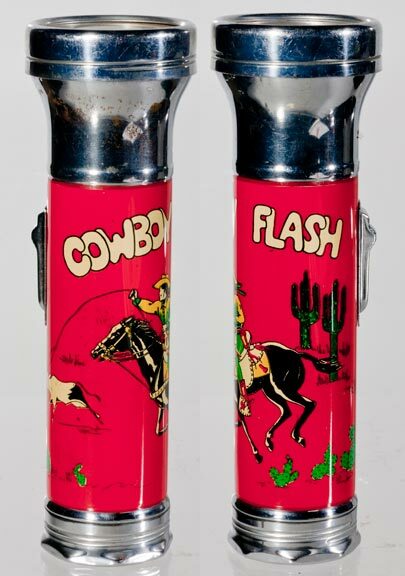 A collection of tin lithographed flashlights is a review of comic and personalities that were popular in comic strips and on television. 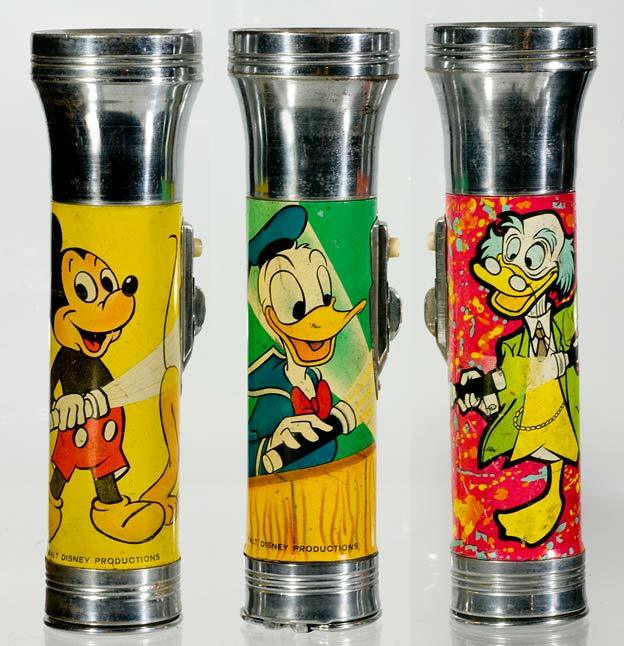 These are inexpensive tin flashlights with lithographed designs. 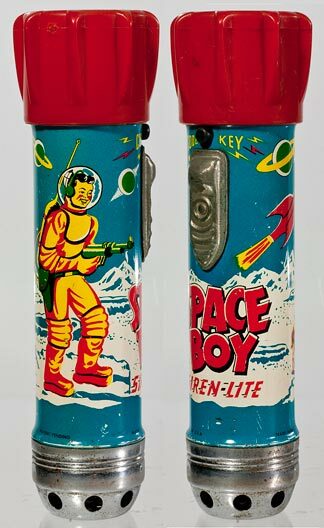 The Pluto tin lantern made about 1958. 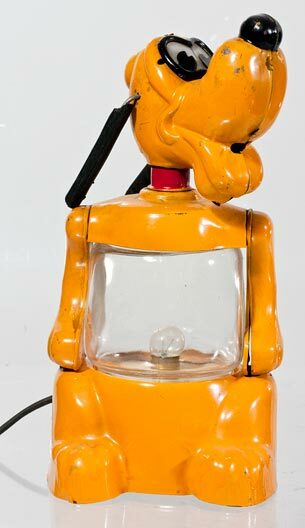 USALite Mickey Mouse light. 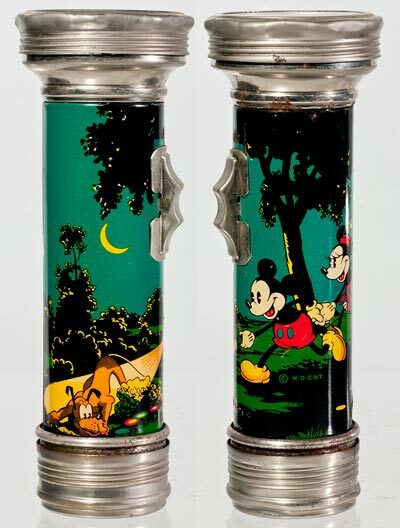 It was made in 1935 and 1936 and used 2 "D" cells. 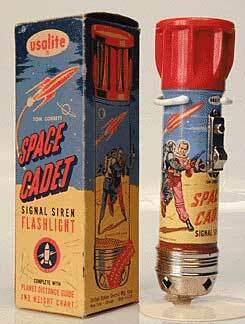 There were 3 other USALite lights made in a similar style that I am seeking. They were the Donald Duck Serenade, The Three Little Wolves, and the Silly Symphony Joy-A-Teers. 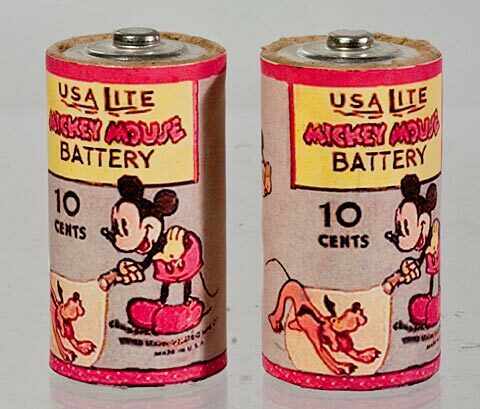 USALite Mickey Mouse "D" cells. 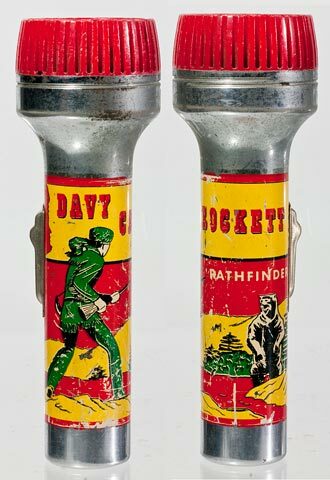 These were made about 1960 and used 2 "D" cells. 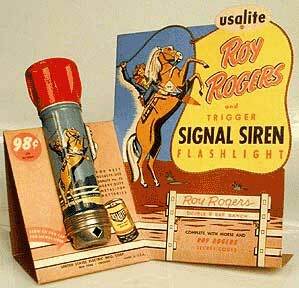 Roy Rogers USALite made about 1955 shown with a store display and the matching Lone Ranger flashlight. 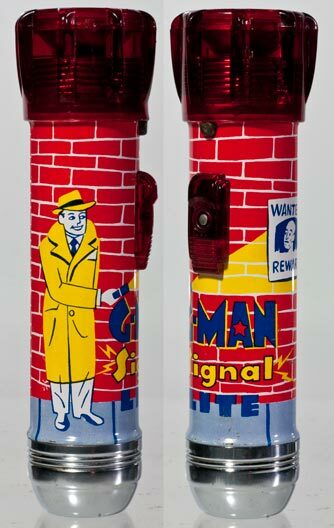 Both used 2 "D" cells. The siren feature (blow through it to make the siren whine) was in the endcap. 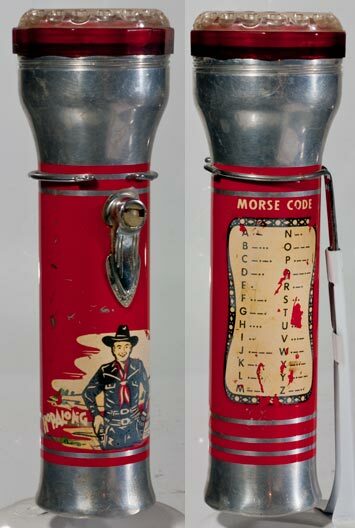 Rare 1950s Hopalong Cassidy Flashlight made by Topper Toys, Chicago. 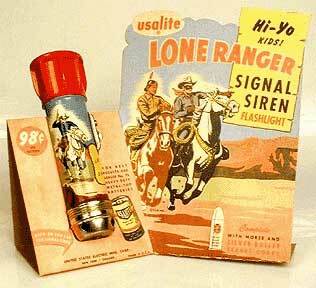 There are more tin litho'd lights that I've seen, such as G-Men, Indian Chief and others. 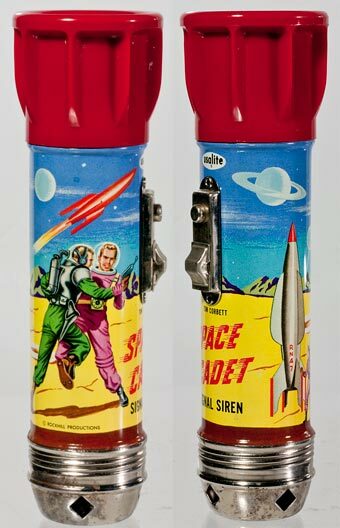 They are a nice reminder of the popular figures and themes of the last 70 years. 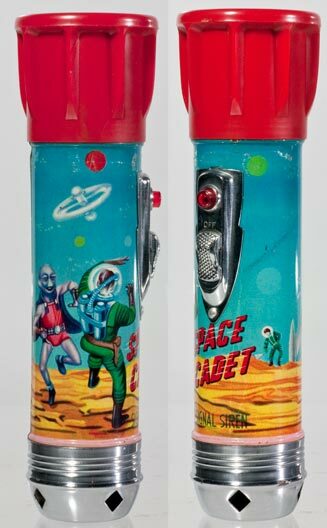 Books #3 on Flashlights, Picture Frames & Halley's Comet| Ghosts In The Cemetery| Waffle Recipies| Links Copyright 2009 through 2019 by Stuart Schneider. Do not use any parts of these pages without written permission.